Relive the 70th ATLA Annual Conference in Long Beach, California, by downloading a copy of the 2016 Summary of Proceedings. Enjoy papers, presentations, and panels from theological librarians including, “Theological Librarianship in the Age of Digital Humanities” by Bobby Smiley; “Open Source Software in Theological Libraries” by Richard M. Adams, Matthew S. Collins, and Myka Kennedy Stephens; and “The Silence of the Religious Archive on Issues of Social Justice: Exploring the Political Activity of Two Denominations Through Primary Source Materials” by Christopher J. Anderson, Colin Dube, and Shanee’ Yvette Murrain. 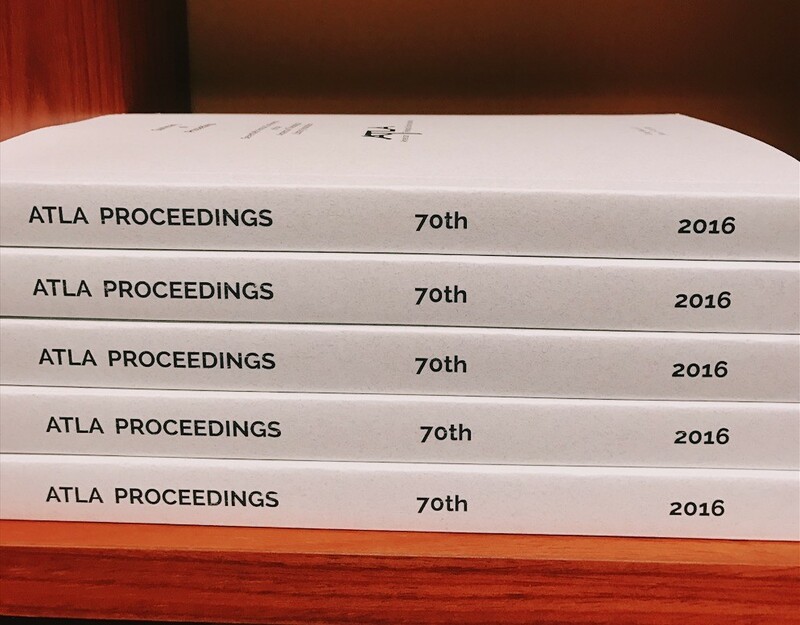 The Proceedings also includes reports from the Denominational Groups, Interest Groups, and Committees, and includes the organizational and membership directories, the Association of Theological Schools (ATS) and ATLA Library Statistical Report, and the Association Bylaws. This year’s Proceedings is available in EPUB and PDF versions and can be found here. The full text of each edition of the Proceedings is also available in ATLASerials®. Members may log in to access the Proceedings from 2011 to 2016 under the Community section. All Individual, Student, and Lifetime Members, as well as all Institutional and Affiliate Member Representatives, will receive a copy of the Proceedings. Printed editions were mailed out the last week of January. Non-members may subscribe to the printed edition at $60 for domestic and $80 international per volume. Contact a membership associate for more information on subscribing. For any questions or concerns, please contact memberrep@atla.com.